Every body is different, and so is everyone’s favorite supplement stack. Stephanie’s stack works great for her, but she’d encourage you to listen to your body and find out what it needs! 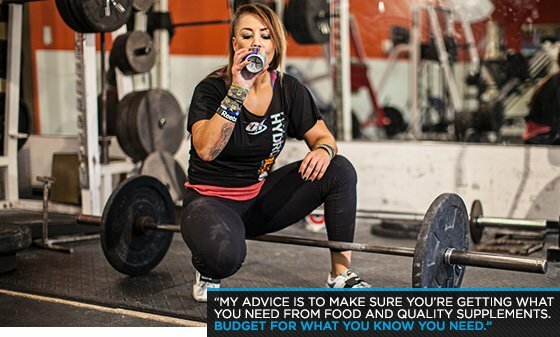 For Stephanie Toomey, supplements fill in the blanks of her well-rounded fitness plan. Because she trains for strength, speed, and endurance, she needs supplements that can support all of her goals. She's found the right stack for her physique and performance needs. Stephanie pays attention to what her body loses during her training, and supplements it back into her nutrition. "Because I'm an Optimum- and ABB-sponsored athlete, and have been part of the development stages of new supplements, I know first-hand which products provide the results they say they do." Stephanie's stack isn't fancy. It's filled with the basics to help her body recover for her next training session. She says, "I like to go by the acronym DTS: diet, train, and supplement. I don't go by STD, which is supplement, train, and diet. I think a lot of people waste time and money by supplementing, rather than eating whole food and training correctly." There's no reason to rely on supplements to make your gains. When Stephanie's body "speaks," she listens. Often this means tweaking her supplement routine. "My supplements have changed. I used to do pre-workouts. Now, I've cut back when I'm not training. I only use stimulants when I train." "I know supplements can get expensive," Stephanie says. "So my advice is to make sure you're getting what you need from food and quality supplements. Budget for what you know you need."